This year’s 2018 Anzac Day services will be the last of the special Centenary Commemoration services remembering all those who served in World War 1 and especially those who paid the Supreme Sacrifice in 1918. The Weekly Times will pay tribute in a special World War 1 commemorative edition next week acknowledging all those who offered their service to their “God, King and Country” and the many who laid down their lives paying the supreme sacrifice for their fellow countryman and woman. 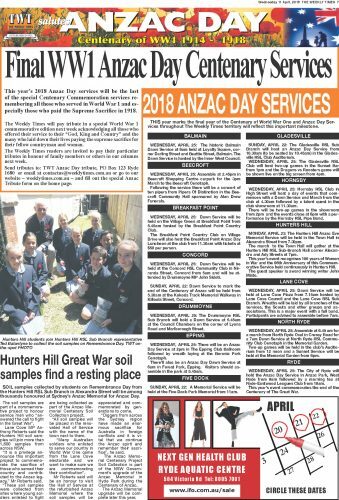 THIS year marks the final year of the Centenary of World War One and Anzac Day Services throughout The Weekly Times territory will reflect this important milestone. WEDNESDAY, APRIL 25: The historic Balmain Dawn Service at 6am held at Loyalty Square, corner Darling Street and Beattie Street, Balmain. The Dawn Service is hosted by the Inner West Council. WEDNESDAY, APRIL 25: Assemble at 2.45pm in Beecroft Shopping Centre carpark for the 3pm March to the Beecroft Cenotaph. Following the service there will be a concert of ten pipers from Pipers Of Distinction in the Beecroft Community Hall sponsored by Alan Drew Funerals. WEDNESDAY, APRIL 25: Dawn Service will be held on the Village Green at Breakfast Point from 5.45am hosted by the Breakfast Point Country Club. The Breakfast Point Country Club on Village Drive will also host the Breakfast Point Anzac Day Luncheon at the club from 11.30am with tickets at $50 per person. WEDNESDAY, APRIL 25: Dawn Service will be held at the Concord RSL Community Club in Nirranda Street, Concord from 5am and will be attended by Drummoyne MP John Sidoti. SUNDAY, APRIL 22: Dawn Service to mark the end of the Centenary of Anzac will be held from 5.30am at the Kokoda Track Memorial Walkway in Killoola Street, Concord. WEDNESDAY, APRIL 25: The Drummoyne RSL Sub Branch will hold a Dawn Service at 5.45am at the Council Chambers on the corner of Lyons Road and Marlborough Street. SUNDAY, APRIL 22: There will be an Anzac Day Service at 2pm in The Epping Club Ballroom followed by wreath laying at the Boronia Park Cenotaph. WEDNESDAY, APRIL 25: Anzac Day Dawn Service at 6am in Forest Park, Epping. Visitors should assemble in the park at 5.45am. SUNDAY, APRIL 22: A Memorial Service will be held at the Five Dock Park Memorial from 11am. SUNDAY, APRIL 22: The Gladesville RSL Sub Branch will host an Anzac Day Service from 10.30am (to be seated by 10.45am) in the Gladesville RSL Club Auditorium. WEDNESDAY, APRIL 25: The Gladesville RSL Club will host two-up games in the Sunset Bar from 1pm and the Dragons vs Roosters game will be shown live on the big screen from 4pm. WEDNESDAY, APRIL 25: Hornsby RSL Club in High Street will host a day of events that commences with a Dawn Service and March from the club at 4.30am followed by a talent quest in the club showroom at 11.30am. There will be two-up games in the showroom from 2pm and the events close at 6pm with a performance by the Hornsby RSL Pipe Band. MONDAY, APRIL 23: The Hunters Hill Anzac Eve Memorial Service will be held in the Town Hall in Alexandra Street from 7.30pm. The march to the Town Hall will gather at the Hunters Hill RSL Sub-Branch Hall corner Alexandra and Ady Streets at 7pm. This year’s event recognises 100 years of Women in War and the 95th Anniversary of this Commemorative Service held continuously in Hunters Hill. The guest speaker is award winning writer John Misto. WEDNESDAY, APRIL 25: Dawn Service will be held at Lane Cove Plaza from 7.15am hosted by Lane Cove Council and the Lane Cove RSL Sub Branch. Wreaths will be laid by all branches of the services, the Scouts and other groups and associations. This is a major event with a full band. Participants are advised to assemble before 7am. WEDNESDAY, APRIL 25: Assemble at 6.45 am for a march from North Ryde Oval in Cressy Road for a 7am Dawn Service at North Ryde RSL Community Club Cenotaph in the Memorial Garden. Two-up games will be held in the club’s Auditorium from 12 noon and a Sunset Service will be held at the Memorial Garden from 6pm. WEDNESDAY, APRIL 25: The City of Ryde will hold the Anzac Day Service in Anzac Park, West Ryde from 9am followed by a morning tea at Ryde-Eastwood Leagues Club from 10am. This year’s event commemorates the end of the Centenary of The Great War.